Born in Phoenix, Arizona in 1942, Ed Mell started drawing as soon as he could hold a pencil. Influenced by his older brother Frank’s drawings of World War II combat aircraft and soldiers, Mell found his own hobby designing model automobiles. His interest in automobiles continued into high school, where Mell could usually be found drawing one of his friend’s cars or watching car commercials for future drawing ideas. Graduating from Phoenix Junior College with an Associated Arts Degree, he enrolled in The Art Center College of Design in Los Angeles to pursue his interest in illustration. During his four years of study there Mell broadened his artistic technique and learned to express his artistic conviction. In November, 1967, he accepted a position as a junior art director at Kenyon and Eckhardt, a major New York advertising firm. However, in only 10 months Mell found that the advertising world smothered his creativity. Considering a move back to Los Angeles, he called an old friend, Skip Andrews, who assured him that work there was scarce, and that he himself was planning to move to New York. A few months later Mell and Andrews established their own illustration firm, which they named Sagebrush Studios. Sagebrush Studios became an immediate success, with major corporate clients such as Cheerios and RCA, and illustrations appearing in Esquire and Psychology Today. But success had its price, and within three years the Arizona native was struggling with the fast-paced New York lifestyle and pressures of the advertising business. Mell jumped at the opportunity to teach summer classes in silk screening and drawing on the Hopi Reservation at Hotevilla, Arizona. When the summer session was complete, he took a hard look at his future and decided to get back to his Arizona roots. A few months later he and Andrews closed Sagebrush Studios. Returning to Phoenix, Mell and his younger brother decided to open their own illustration business. But the Phoenix market for illustration was in less demand than Mell was used to, so during breaks he began sketching landscapes using colored pencils. Colored pencils slowly turned into paints and by 1978 he had made the transition from commercial artist to landscape painter. Throughout the years, Mell has constantly changed the subjects he depicts and the techniques to capture them. Beginning specifically with southwest landscapes, he has moved to other southwestern subjects including cowboys, horses, longhorn cattle and cactuses. Although best known for his oil paintings, he also developed an avid body of collectors for his bronze sculptures. Collectors are often left with a unique visual impression when they witness first-hand the tangling of reality with imagination. 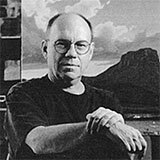 Ed Mell has won numerous awards and honors. His art has been exhibited in nine museum shows, including the Eiteljorg Museum of American Indian and Western Art, Scottsdale Center for the Arts, Mesa Southwest Museum, and the Rockwell-Corning Museum of Modern Art. More than 40 corporate and private collections have acquired his paintings and sculptures, and his life as an artist has been chronicled in major art publications. His biography, "Beyond the Visible Terrain: The Art of Ed Mell," was published in l996. His art also has been featured prominently in "Leading the West: 100 Contemporary Painters & Sculptors" and "Place of Spirit: Canyon de Chelly, 100 Years of Painting and Photography."